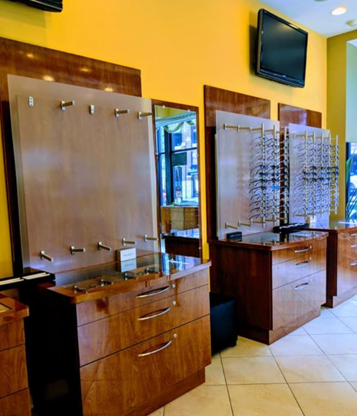 Burglars broke into Joanna Slusky’s optometry office in Lakeview early Monday, escaping with over 100 high-end frames as well as a computer and iPads, she said. Now, she’s hopeful that someone will recognize the men who shattered a window and “devastated” her office in just 35 seconds. 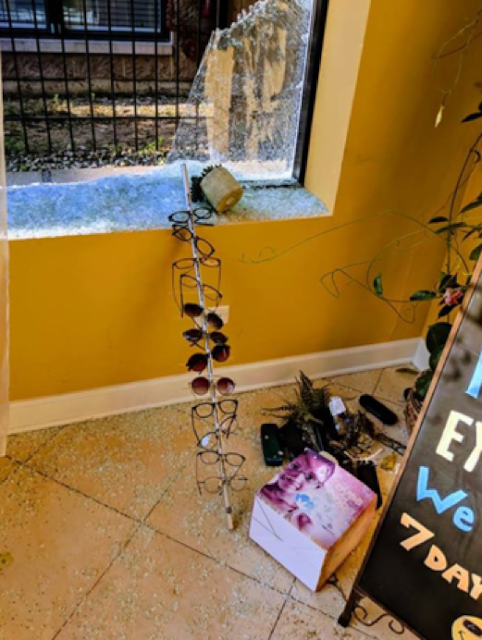 Police responded to Halsted Eye Boutique, 2852 North Halsted, around 8:15 on Monday morning after Slusky discovered the break-in. “My heart shattered,” when she discovered the burglary, she said on Facebook. Video surveillance shows the burglars made entry just before 5:30 a.m.
Once inside, the thieves ripped apart display cabinets, collected 150 pairs of name-brand frames, and took three iPads along with a laptop, Slusky said. Photos posted to Facebook show a boulder lying in the middle of the office. It was apparently used to smash through one of the store’s large windows. In another photo, wall displays are stripped of frames.